Wedge boots with 3D straps. 4 recolorable areas, 3 color variations, custom thumbnails, new custom mesh base game compatible. Ankle strap high heel sandals. 3 recolorable areas, 3 color variations, custom thumbnails, new custom mesh, base game compatible. Colored Peep Toe Pumps. 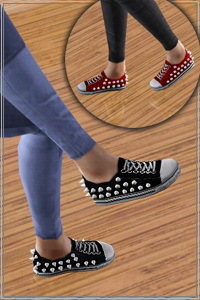 A great EA shoes texture adapted and modified for a new custom mesh with a trendy look. Recolorable, base game compatible. Vanity shoes, 3 recolorable areas, custom CAS and launcher thumbnail, 1 color variation included. Wedge flip flops with recolorable nails. 3 recolorable areas, 3 color variations, custom cas and launcher thumbnails.